الخيار الأفضل للحصول على المتعة والاسترخاء, فندق ذا آيلاندر يقع في منطقة Avarua في راروتونجا. يقع مركز المدينة المثير على بعد 1.2 km فقط. بالنسبة لمن يريد الخروج، هذه بعض المعالم السياحية المتوفرة للزوار Cook Islands Whale Education Centre, Avatiu Harbour, Punanga Nui Market. إن الخدمات التي يقدمها فندق ذا آيلاندر تضمن للنزلاء إقامة مريحة. يمكن الاستمتاع بمجموعة من الخدمات على أعلى المستويات في الفندق كمثل أمن على مدار 24 ساعة, خدمة التنظيف يوميًا, فاكس, آلة تصوير, خدمة سيارات الأجرة. بالإضافة لهذا,تتضمن كل غرف الضيوف مجموعة واسعة من وسائل الراحة . بعض الغرف توفر حتى تلفزيون بشاشة مسطحة, غرف لغير المدخنين, مكيف هواء, خدمة الإيقاظ, مكتب لإرضاء أكثر الضيوف تطلباً. يقدم الفندق مجموعة رائعة من الخدمات كمثل الغوص السطحي, شاطئ خاص, مركز للياقة البدنية, مسار جولف - ضمن 3 كم, حمام سباحة خارجي، لجعل إقامتك تجربة لا تنسى. اكتشف مزيجاً ساحراً من الخدمة الاحترافية والخيارات الواسعة من وسائل الراحة والمتعة في فندق ذا آيلاندر . Very good if you need to spend a night after arriving late or if you need to be close to the airport to catch a flight the next day. Staff is nice and helpful. There is no real beach and the pool is kind of in the middle of the restaurant. Also the Hula Bar and its band are very popular and play until 11:30pm. Which is great if you want that but a bit loud if you are trying to sleep. Hotel provides ear plugs and they actually work pretty well since I fell asleep by 10:30 and missed the last hour of music. On arrival, I was greeted with a smile. The lady at reception when I arrived in at after 2am was very warm and welcoming. Fast check in process. No complaints there. The room itself had a stale stench to it. The tv channels were not clear and was only 3 channels, they did provide a hardrive however this did not work. I was disappointed with the breakfast, everything warm was cold and did not have a good variety, could definitely do with some improvement, I didn't bother with the breakfast the second day. I kept trying to order food off their menu but each time was told that they could only provide pizza and chips. When I travel I like to try the different foods, so was very disappointed. Hula bar happy hour was handy to have at the resort and the staff there were amazing. However one night there was an event on and I was not allowed access unless I paid a cover charge of $5 which was fine but being told I would have to leave the area if did not pay was a bit disappointing. 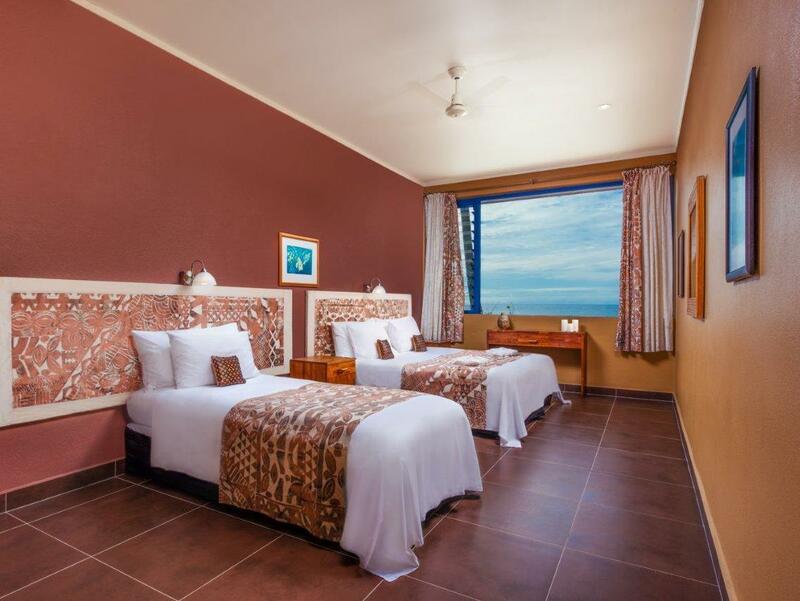 excellent hotel for short stays, convenient to town, walking distance to airport. Value property. popular with locals for weekend entertainment. Music can get a little loud but ended at a reasonable hour. Had a massive room that was clean and well maintained. Couldn't hear any noise from the bar and it was and easy chimed in process! We stayed at The Islander Sep/Oct 2016. We had 2 x 6year olds with us. Location was great. Food was awesome, although the continental bfast was basic it did the job. Most staff were friendly. Even though it had the popular and busy Hula bar going till 11pm we didn't find this disturbing at all with the kids. Would stay there again. Great value for $$$. 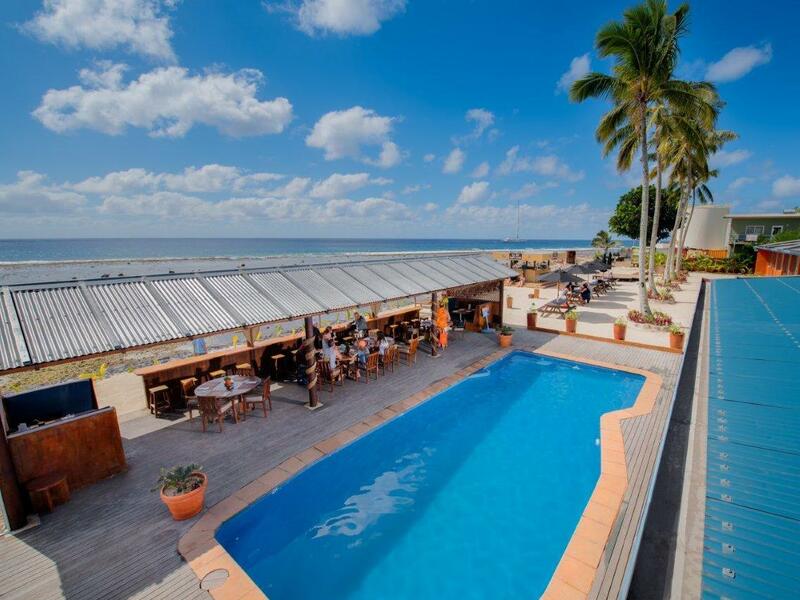 This is a great hotel if you are stopping in Rarotonga before departing for other islands in the Cooks. Literally right across the street from the airport so easy to walk & open 24 hrs too. They offer bag storage ($5/day per bag) for those of us traveling with more than just one bag...this place is not fancy but it's totally serviceable and the food is good too!! Very good location with friendly staff. They picked us up from the airport by a shuttle even if it the hotel is only 2-3 minutes walk. The bed linen was clean but the blanket was a little smelly. Although our rooms should have been with ocean view, we got larger room with no view as the window is quite high facing the street. Good if you want a quieter place as the Hula Bar is just in front of the ocean facing rooms. Affordable. Value for money. Great rooms, great staff, great restaurant food & an all day happy hour bar. What more could you want? Highly recommend. The photo is a little misleading. The pool is the middle of 2 dining areas. No one used the pool at all over our 3 night stay. The lagoon in front is not recommended for swimming. Really need to use bus or hire scooters to get around. Staff and management were amazing. Would stay again, but with lower expectations knowing what we know. We were very happy with our stay at the Islander it is a very happening spot and the rooms were always immaculate. The food is delicious. We enjoyed the pool. 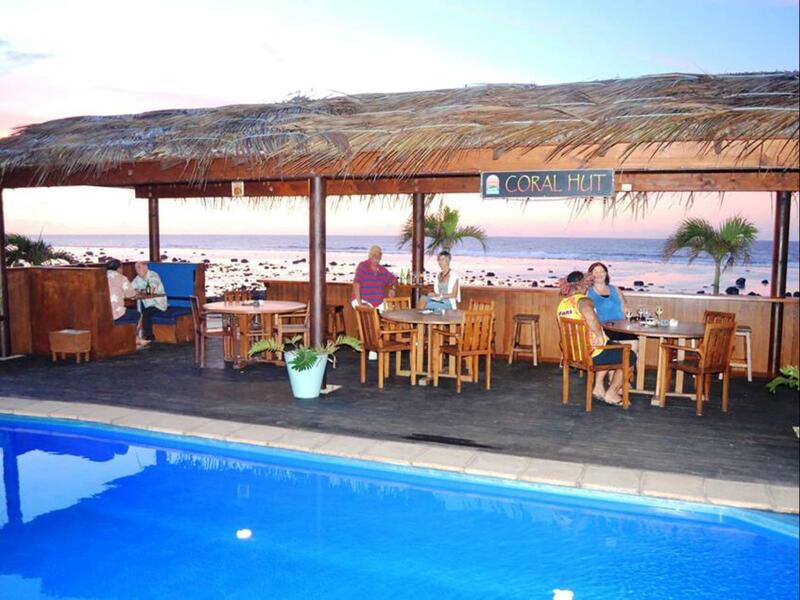 It would be an awesome place to stay for couples or young groups of singles as the Hula Bar is a popular nightspot. The staff were always helpful. A good place to stay at beginning and end of your trip! We thoroughly enjoyed our stay at the Aquarius, the staff were awesome, so lovely and friendly, our room was airy and clean with a lovely view. The food was great, the pool was the favorite of the children. It was close to the town. Would definitely stay again. We booked an ocean view room but instead we were allocated a room by a noisy street. There was one high window. There were no curtains or blinds at the window, so the light shone in all night, including from car headlights. There was traffic all night, until the small hours of the morning. We got no sleep because of the traffic noise and lights. There were a few cockroaches in the bathroom. Very disappointing. All good. Convenient for late night flight. Great pool and tasty meals. Reception staff could be friendlier. Staff could have been friendlier how place served its purpose as arrived in the early hours.